Because ‘calm’ means something different to everyone, there are no steadfast rules here. It all comes down to personal preference. We’re here to be your guide to all things calm so you can feel relaxed in your home. The first place to start is to consider what calm means to you. What colors are soothing to you? How does your environment currently affect your mood? Brian says, “The bottom line to creating a space that feels calming and relaxing is surrounding yourself with things that you love and that are meaningful to you.” This might be accessories, evocative artwork, or pictures and souvenirs of happy times. On the other hand, you may prefer a monochromatic, minimalistic approach. You also want to consider comfort. A big part of feeling calm and relaxed in your space is feeling comfortable. So look for frames that sit well and fabrics that feel soft to the touch. When it comes to color, blues tend to be soothing whereas bright, loud colors are more energizing. Consider the rooms in your home that you want to be more energized as opposed to the ones that you want to instill a sense of peace. Learn all the basics of color theory and discover the power of color in your home with our FREE Interior Design Color Theory Guide. It’s also important to consider the focal point of the room. This will not only define the space but it can also impart a sense of calm if the focal point is a beautiful view, a fireplace, or a piece or artwork. Everyone has a different way of approaching life and of filling their homes with belongings. Universally though, it stands to reason that excess clutter is never good for the mind. If you don’t believe us, just ask Marie Condo. Her book, “The Life-Changing Magic of Tidying Up” provides you with effective tactics to reduce clutter and lead an organized, stress-free life. The idea is simply to clear out your home of superfluous accessories, belongings, and clothing that doesn’t fit you. To summarize, she asks you to pick up every item you own and ask yourself if it brings you joy. If it doesn’t, donate it if you can or throw it away. Brian makes the point that especially the entryway of your home “should always be clutter-free.” The last thing you want is to be overwhelmed as soon as you walk in the door. “It sets the tone for the rest of the house,” he describes. If you have kids, and therefore toys, find storage that allow you to store the “clutter” out of sight. Simple solutions like a storage ottoman or credenza can solve this problem. Once you’ve cleared out and identified the stress points in your home, you can begin to add in soothing and peace-inducing elements. You may be surprised that the simplest additions to your home can make the biggest difference in creating a calming feeling. Natural elements like crystals, flowers, and botanical prints. Nature brings a sense of calm to many people, and these are simple ways of bringing the outside in. Plants are another way of bringing the outdoors in. They’re a natural air filter and purifier and they have a calming effect on your space. Candles and ambient lighting, like fairy lights, create a soothing, spa-like environment. They also add warmth and coziness in the cooler months. Consider investing in an essential oil diffuser or another form of aromatherapy. Diffusing essential oils is a simple and cost-efficient way of instantly turning your space into a spa. Lavender, chamomile, and lemongrass have a calmative effect. Introduce items that bring a smile to your face! It could be a print, a piece of artwork, or a souvenir from traveling. Feeling peaceful is personal and you want to bring in items that make you feel good. It’s essential to enjoy the environment in your home. And fortunately, you might find that once you begin, you will really enjoy the process of clearing out and creating a calming environment in your home. Start by eliminating items that don’t serve you, clearing out your home, and organizing it in a way that works for you. Next, bring in accessories, plants, natural elements, and items that bring you a sense of peace and joy. Don’t forget to consider comfort in your furniture as well. Our designers can help you create a functional floor plan and bring in items that will make your life at home a little more peaceful. 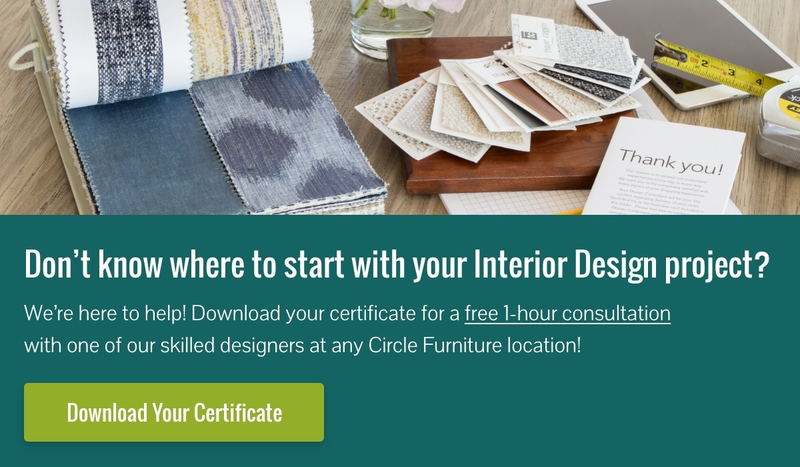 Get to know our designers and come into a showroom near you to get started. Visit us on Instagram and Pinterest for more design inspiration!